Developing a project requires a lot of creativity and imagination. In order to fulfill all the requirements and make the users happy, you have to understand their problems and their expectations. Then, you need to find ways around some problems to make everything work smoothly. Seeing the results of your efforts is always a great reward, especially when the product makes a real difference – and RapidSOS does. RapidSOS is a US-based privately funded company in the emergency services platform business. They have partnered with Internet of Things companies and the public safety community to create the RapidSOS Emergency API — a product that links any connected device to 9-1-1 and first responders, making it possible to get unprecedented life-saving data to public safety in an emergency. When we were first approached by RapidSOS, they were developing their Emergency API. At that time, they already had an existing platform that was receiving signals from the outside and processing them, but the steps of this process were customized separately for each client. In order to be able to serve more clients quickly, they needed a new, more intuitive module for the interface where the users could design workflows on their own, interactively and graphically. While trying to develop such a solution, they came across the Rappid framework (coincidentally no association with RapidSOS), but having no in-house experience with said technology, they decided to work with Neoteric. In the first three weeks, we utilized Rappid to build a proof of concept based on the delivered requirements. After getting the green light to move on to the second phase of the project, we began building the front-end portion of a fully-functional product. During that phase, we faced some challenges, the biggest of them being the restrictions of Rappid itself. In order to fulfill the requirements of RapidSOS, we needed to extend the capabilities of the framework and develop one of its functionalities. The solution worked and was eventually implemented by the creators of Rappid and included in its next version. As the module we created solved the problem presented to us by RapidSOS and there was no further need to customize the process for each user. In April 2018, RapidSOS teamed up with Uber to pilot an in-app 911 feature with emergency authorities in multiple cities. The feature helps participating 911 centers better locate mobile 911 callers and provides valuable safety and security for Uber users. 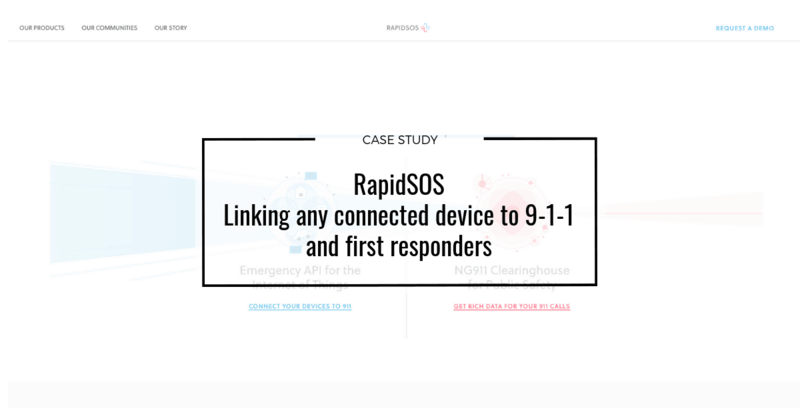 Also in April, Microsoft Ventures joined RapidSOS in a $16M funding round to accelerate the deployment of the RapidSOS Next-Generation-911 Clearinghouse, a free software upgrade for 911 centers to receive data from IoT devices utilizing the Emergency API.